Anthony Kevin "Tony" Dungy (/ˈdʌndʒi/ DUN-jee; born October 6, 1955) is a former professional American football player and coach in the National Football League (NFL). Dungy was head coach of the Tampa Bay Buccaneers from 1996 to 2001, and head coach of the Indianapolis Colts from 2002 to 2008. Dungy announced his retirement as coach of the Indianapolis Colts on January 12, 2009 following the Colts' loss in the playoffs. The Colts qualified for the playoffs in every season they were coached by Dungy. Since retirement, Dungy has served as an analyst on NBC's Football Night in America. He is also the national spokesman for the fatherhood program All Pro Dad. Dungy was elected to the Pro Football Hall of Fame on February 6, 2016. After playing quarterback in college for the University of Minnesota, Dungy went undrafted in 1977 and was signed as a free agent by the Pittsburgh Steelers of the National Football League as a safety. He played as a defensive reserve and special teams player for the Steelers in 1977 and the Super Bowl champion 1978 season, leading the team in interceptions in the latter campaign. In 1979, Dungy was traded to the San Francisco 49ers, then finished his career a year later in the training camp of the New York Giants in 1980. Dungy is the most recent NFL player to intercept a pass and throw an interception in the same game. Dungy was the emergency quarterback for the Pittsburgh Steelers in a 1977 game against the Houston Oilers when both Terry Bradshaw and Mike Kruczek went down with injuries on October 9, 1977. He played safety on defense. Dungy has one Super Bowl title as a player, as he was a member of the Steelers when they won Super Bowl XIII. Following his NFL experience as a player, Dungy was invited to become an assistant coach for his alma mater, the University of Minnesota in 1980. After one season in charge of defensive backs, he was asked to return to the NFL, this time as a coach. He was hired as an assistant by Steelers head coach Chuck Noll, his former head coach from his playing days with the team, in 1981. His work under Noll put Dungy in the Sid Gillman coaching tree. In 1982, he was named defensive backfield coach, and was promoted in 1984 to defensive coordinator. He left the Steelers in 1989 to become the defensive backs coach for the Kansas City Chiefs, and took over the defensive coordinator position for the Minnesota Vikings under Dennis Green in 1992. While at Minnesota, Dungy's defense was ranked first in the NFL. Dungy achieved his dream of being an NFL head coach when he was hired by Rich McKay to reform the Tampa Bay Buccaneers, a team then well known for its lack of success, on January 22, 1996. Dungy installed his version of the Cover 2 defense with defensive coordinator Monte Kiffin with a few new wrinkles. The result was the now-famous Tampa 2, though Dungy openly admitted it was based on concepts he had picked up from his days in Pittsburgh. Despite finishing with a 6-10 record in 1996, the Buccaneers finished strong and showed signs of developing into a winning team. After a home win versus the Raiders, the Buccaneers fell to a quick 14–0 hole to the Chargers in San Diego. Instead of folding, the team fought to a hard win, their first win on the West Coast in 15 years. Many Bucs fans believe that this was where the long-beleaguered franchise finally turned the corner. It turned out to be the only losing season Dungy would suffer as a head coach. In 1997, the Buccaneers started 5-0--their best start since 1979. They ultimately finished second in the NFC Central division, Tampa Bay's first winning season since 1982. In the last game played at Tampa Stadium, the Bucs defeated the Detroit Lions for only their second playoff win in franchise history. They lost the next game to the defending champion Green Bay Packers. While the Bucs barely missed the playoffs in 1998, they rebounded strongly in 1999 to win their first division title since 1979, only to lose to the St. Louis Rams in the NFC Championship Game. They went on to reach the playoffs again in 2000 and 2001, only to be defeated in the wild card round each time by the Philadelphia Eagles. The Bucs were hobbled by constant changes to the offensive coordinator position; QB Shaun King had to work with three different coordinators in three years. Dungy was fired on January 14, 2002 due to the club's repeated losses in the playoffs. Additionally, owner Malcolm Glazer felt Dungy's offense was too conservative. Dungy thus became the first coach in Bucs history to leave the team with a winning record. The following season, the Buccaneers won Super Bowl XXXVII, their first appearance in the championship game. Though Dungy was fired the prior season and replaced with Jon Gruden, Dungy has been credited for constructing the team. On January 22, 2002, Dungy was hired as head coach of the Indianapolis Colts, a team that at the time was very potent offensively, but very weak defensively. He installed his "Tampa 2" defense immediately and continued to retool the Colts' defense to his liking during his tenure. After joining the Colts, Dungy left the high-powered offense previously installed there by Jim Mora, in both playing style and in personnel, virtually unchanged. Dungy was reunited with Tom Moore, who was retained as offensive coordinator. Moore and Dungy had previously worked together at Minnesota and Pittsburgh. During his early tenure in Indianapolis, Dungy struggled to fix the Colts' defense and had mixed results in the postseason. In his first season at Indianapolis, the Colts were shut out 41–0 by the New York Jets in a first-round playoff game, and the team lost postseason games to the New England Patriots in both 2003 (in the AFC championship game) and 2004 (in the second round of the playoffs). Dungy signed a three-year contract extension in October 2005 for US$5 million per year. The Colts focused on defensive improvements during the 2005 offseason, signing five-year defensive tackle Corey Simon. Widely expected to be a Super Bowl contender, the Colts won their first 13 games, prompting much speculation about the possibility of the Colts becoming the NFL's first team to finish the season undefeated since the 1972 Miami Dolphins. Their thirteenth win guaranteed the Colts home field advantage throughout the playoffs. With nothing to play for except the chance to go unbeaten, the Colts lost their 14th game to the San Diego Chargers. The Colts played their starters sparingly in the last two games. The Colts lost in their first playoff game to the eventual Super Bowl winner Pittsburgh Steelers. This loss made the Colts the first team to ever start a season 13–0 and not reach the Super Bowl. The Colts' 2006 playoff run was characterized by a marked improvement in defensive play, as the Colts defeated the Kansas City Chiefs, holding one of the NFL's best running backs to less than 50 yards, and upset the favored Baltimore Ravens in the divisional round. On January 21, 2007, after trailing 21–3, the Colts defeated the New England Patriots to become AFC Champions and advanced to Super Bowl XLI. This was the largest comeback in conference title game history. By a matter of only a few hours, Dungy became the second African American coach to lead his team to the Super Bowl. His good friend, Chicago Bears head coach Lovie Smith, had clinched the NFC's bid in the Super Bowl earlier in the day. On February 4, 2007, Dungy and the Colts won Super Bowl XLI 29–17 over the Bears at Dolphin Stadium in Miami. On December 23, 2007, with a win over the Houston Texans, Dungy won his 72nd game as Colts head coach, passing Don Shula to become the winningest coach in franchise history. On January 21, 2008, Dungy announced that he would return at least for the 2008 season. During the 2008 season, the Colts won 12 regular season games, including their last nine straight, clinching a wildcard berth, but were upset 23–17 in overtime by the San Diego Chargers in the wildcard round of the 2008–09 NFL playoffs. On January 12, 2009, Jim Caldwell who'd been a long time Colts assistant was chosen as the new head coach for the Indianapolis Colts after being named Dungy's future successor a year earlier. On November 1, 2010, the Colts added Tony Dungy's name to the Indianapolis Colts Ring of Honor located on the middle balcony on the east side of Lucas Oil Stadium. Dungy (center) along with colleagues Dan Patrick and Rodney Harrison at a NFL game in Denver in September, 2013. 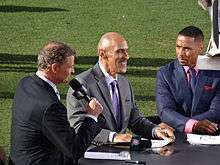 In June 2009, NBC Sports hired Dungy to serve as a studio color analyst on the network's weekly Sunday Night Football pregame show, Football Night in America. Dungy's career has included several notable firsts. Among them, Dungy is the first NFL head coach to defeat all 32 NFL teams. He was also the youngest assistant coach at age 25 and the youngest coordinator at age 28 in NFL history. Dungy was the first African-American head coach to win the Super Bowl (with the Colts' victory over the Bears in 2007). He was the third black head coach to win a pro football championship in North America, behind Darren Arbet of the San Jose Sabercats (Arena Football League) who won ArenaBowl XVI in 2002 and Pinball Clemons of the Toronto Argonauts (Canadian Football League) who won the 92nd Grey Cup in 2004. Dungy also became the sixth man to play in a Super Bowl and be the head coach of a Super Bowl team. He joins Dan Reeves, Sam Wyche, Mike Ditka, Forrest Gregg and Tom Flores. Ron Rivera also accomplished this feat with the Carolina Panthers in 2015. After the win in Super Bowl XLI, Dungy became the third man to win Super Bowls both as a player and a head coach, following Ditka and Flores. On offense, Tony Dungy's strategy involved a conservative, ball-control offense based primarily around running the ball and short, high-percentage passes when he was at Tampa Bay. At Indianapolis, he inherited and kept the offense designed by offensive coordinator Tom Moore because the offense was in the hands of someone he knew and trusted. In both cases, most of the offensive planning has been handled by his offensive coordinators. On defense, Dungy used a stifling "Cover 2" style zone defense, which usually was based around a formation of 4 linemen, 3 linebackers, and 4 defensive backs. The "Cover 2" defense Dungy used involved his linemen rushing the passer, the cornerbacks covering the passing flat area, the linebackers covering the middle of the field, and the safeties providing deep coverage on each half of their respective zones. While the Cover 2 defense was not a new concept, Dungy contributed to its greater use by systemizing it into an every-down defense. The personnel and techniques that Dungy used in this defense were very specific, and as a result, his style of defense earned the moniker of the "Tampa 2" around the NFL. Moreover, Rod Marinelli, the defensive line coach under Dungy at Tampa Bay, was the head coach of the Detroit Lions from 2006 to 2008. Mike Shula, the offensive coordinator under Dungy at Tampa, was the head coach at the University of Alabama from 2003 to 2006. Herman Edwards, the former head coach for the New York Jets and Kansas City Chiefs was an assistant head coach under Dungy at Tampa Bay. Jim Caldwell, an assistant under Dungy in Indianapolis, was promoted to head coach in 2009, and coached the Colts for three seasons. Joe Barry, a linebackers coach under Dungy at Tampa Bay, was the defensive coordinator for the Detroit Lions from 2006 to 2008. Dungy is listed as not only a part of the Bill Walsh coaching tree, but also a part of the Marty Schottenheimer coaching tree. The Dungy tree grew from the roots of the Pittsburgh Steelers' dynasty of the 1970s. He was influenced by the defensive schemes learned under Chuck Noll and Bud Carson. Dungy said that he inherited most of the coaching philosophies from Noll and he is proud to be a protégé of Noll. Dungy stresses that coaches are essentially teachers who put faith and family ahead of football and do not belittle their players or scream at them. Also, like Dungy, they remain calm when things go badly. They guide instead of goad, and Lovie Smith found that perhaps the most instructive thing of all. I think as you look to young coaches coming up in the ranks, a lot of us have a picture of how a coach is supposed to be, how he is supposed to act...And I think what Tony Dungy showed me is you don't have to act that way. I really wanted to show people you can win all kinds of ways. I always coached the way I've wanted to be coached. I know Lovie has done the same thing. For guys to have success where it maybe goes against the grain, against the culture.... I know I probably didn't get a couple of jobs in my career because people could not see my personality or the way I was going to do it.... For your faith to be more important than your job, for your family to be more important than that job.... We all know that's the way it should be, but we're afraid to say that sometimes. Lovie's not afraid to say it and I'm not afraid to say it. Chuck's philosophy was to convince every guy on the team that his role was important. If you came in as a free agent and were just a gunner on the punt team or the third safety, you were doing something the team needed to win...It was his way of emphasizing that no one is irreplaceable. You have to coach everybody the same way. If Joe Greene goes out, Steve Furness goes in and we're not going to change anything. Chuck never panicked when someone got hurt or held out. We can still function. That made a big impression on me. 10 6 0 .625 2nd in NFC Central 1 1 .500 Lost to Green Bay Packers in NFC Divisional Game. 11 5 0 .688 1st in NFC Central 1 1 .500 Lost to St. Louis Rams in NFC Championship Game. 10 6 0 .625 2nd in NFC Central 0 1 .000 Lost to Philadelphia Eagles in NFC Wild-Card Game. 9 7 0 .562 3rd in NFC Central 0 1 .000 Lost to Philadelphia Eagles in NFC Wild-Card Game. 10 6 0 .625 2nd in AFC South 0 1 .000 Lost to New York Jets in AFC Wild-Card Game. 12 4 0 .750 1st in AFC South 2 1 .666 Lost to New England Patriots in AFC Championship Game. 12 4 0 .750 1st in AFC South 1 1 .500 Lost to New England Patriots in AFC Divisional Game. 14 2 0 .875 1st in AFC South 0 1 .000 Lost to Pittsburgh Steelers in AFC Divisional Game. 12 4 0 .750 1st in AFC South 4 0 1.000 Super Bowl XLI champions. 13 3 0 .813 1st in AFC South 0 1 .000 Lost to San Diego Chargers in AFC Divisional Game. 12 4 0 .750 2nd in AFC South 0 1 .000 Lost to San Diego Chargers in AFC Wild-Card Game. In August 2007, President George W. Bush appointed Dungy a member of the President's Council on Service and Civic Participation. The 25-member council represents leaders from government, business, entertainment, athletics and non-profit organizations committed to growing the spirit of service and civic participation. The two-year appointment requires attendance at two in-person meetings per year and quarterly phone conversations with assigned committees. After receiving the call from President Bush, Dungy remarked "It was something that was really hard to believe. Certainly, when you go into football coaching, you’re not expecting to get presidential appointments to anything." In March 2009 President Barack Obama invited Dungy to join the Advisory Council on Faith-Based and Neighborhood Partnerships. He declined the invitation to join the council because of scheduling conflicts, as he could make only two of 2009's four council meetings, but agreed to be an informal adviser on fatherhood issues. He had also turned down offers from National Football League Players' Association to become liaison to the NFL. Dungy is an evangelical Christian and at one point in his coaching career considered leaving football for the prison ministry. Throughout his career, he has remained involved with community service organizations. Dungy's tenure in Tampa Bay as the head coach of the Buccaneers brought greater attention to his personal accomplishments outside of sports. He has been active in many community service organizations in the cities in which he has coached. While in Tampa Bay, Dungy worked as a public speaker for the Fellowship of Christian Athletes and Athletes in Action. He began a mentoring program for young people called Mentors for Life, and provided Buccaneers' tickets for the participants. He also supported other charitable programs in the area such as Big Brothers/Big Sisters, Boys and Girls Club, the Prison Crusade Ministry, foster parenting organizations, and Family First. He continues to assist Big Brothers/Big Sisters and the Boys and Girls Club in Indianapolis. He also supports the Black Coaches Association National Convention and Indiana Black Expo. His community involvement and care continues in Indianapolis where Tony helped launch the Basket of Hope program at the Riley Hospital for Children. Basket of Hope is a national, non-profit organization which began in 1995. Tony is the National Spokesperson for Basket of Hope and delivers the baskets filled with age and gender appropriate toys, games and craft items to Riley Hospital for Children. Along with the baskets, he delivers a Hope Tote, which includes Quiet Strength, a journal, Bible, Christian music, and other inspirational materials. Dungy worked with Basket of Hope and Riley Hospital for Children to implement the Super Baskets of Hope project where 7,000 baskets and totes were delivered to the 32 NFL cities and participating hospitals during the weeks surrounding Super Bowl XLVI. Dungy was born in Jackson, Michigan. His parents were Wilbur Dungy, Ph.D., (1926–2004) a science professor at Jackson College, and Cleomae Dungy (1920–2002), who taught Shakespeare at Jackson High in Michigan. Wilbur served as a pilot during World War II with the famed Tuskegee Airmen. Dungy is married to Lauren Harris Dungy of Pittsburgh and has two daughters, Tiara and Jade, and five sons, James (died December 22, 2005), Eric, Jordan, Justin and Jason. James committed suicide at age 18, outside of Tampa. The Dungys still keep their home in the Tampa Bay area. Dungy's son, Eric, played football at the University of Oregon for 3 seasons before transferring to the University of South Florida for his final season in 2014. On September 6, 2007, The Indianapolis Star reported that the Davie-Brown Index (DBI), an independent celebrity rating service for advertisers, places Dungy in the top 15 of the 900 actors, musicians, TV personalities, and sports celebrities it ranks for overall appeal, putting him on a level with actors such as Tom Hanks and Morgan Freeman. Among sports figures, he ranks second only to Hank Aaron. On February 27, 2008, Indiana Wesleyan University honored Dungy in a ceremony where he was inducted into IWU's Society of World Changers. Dungy also received an honorary doctorate of humane letters from the university. On August 5, 2009, Dungy spoke at the 53rd General Council of the Assemblies of God. Since retirement, Dungy has become an informal mentor to the formerly suspended NFL player Michael Vick, counseling him during his incarceration and, with the help of Donovan McNabb, convincing Eagles owner Jeff Lurie and head coach Andy Reid to consider signing him to the team's roster. "It's not something I ever really thought of doing. I've had several people ask me about it for a number of years. Several people asked about it after winning (the Super Bowl). I was hoping, really, not to do it... I think it becomes kind of what happens. You win a Super Bowl, you have a big achievement, and you write a book. And I didn't want to be one of those guys, but a lot of people thought that it was the right time -- and it did turn out to be that. I think people were looking for something positive to read, and we had a lot of negative in the sports world. I think it just came out at the right time. Maybe the Lord's timing was good." Dungy said he’d actually gotten "more satisfaction" from the success of Quiet Strength than the Super Bowl win. That's because, he said, "I’ve gotten so many calls and letters from people saying they really got something out of it, something that helped them." On January 10, 2008, Quiet Strength reached 1,000,000 copies in print. Quiet Strength was on the New York Times Best Seller List for 32 weeks, including 27 in the top 10 for hardcover nonfiction. Dungy also published a 96-page paperback called Quiet Strength: Men's Bible Study on July 18, 2007. Dungy challenged men to answer six questions: What's my game plan? What's my strength? What's success? Where's my security? What's my significance? And, what's my legacy? The book is aimed specifically at men, including those who may not otherwise be interested in spiritual matters. "Three months ago, I would've said 'no' for sure. But the impact of this one has been beyond what I could've dreamed and there may be another one in the future. The focus would probably be on how to develop leadership and a coaching strategy for whatever business you're in; coaching for your family, business, or sport based on Christian principles." Dungy published a 24-page children's picture book called You Can Do It with Little Simon Inspirations, a division of Simon & Schuster on July 8, 2008, reached No. 1 on the children's picture books section of the New York Times Best Seller list on July 27, 2008 and stayed on the top 10 for 5 weeks. The book tells the story of Dungy's younger brother Linden who struggles, then figures out his life dream and is encouraged by his family to follow that dream as a dentist. Dungy said that his other hopes for You Can Do It were that it would encourage parents to read to their kids and that kids would learn the lesson of pursuing whatever field they were talented in, even if it might be not the popular thing to do. "Our young men today are falling into a trap... Society is telling them material success is what's important, but if we buy into that idea, we can spend a lifetime chasing that success and never really have the positive impact on people that would make our lives truly significant." Uncommon reached No. 2 on the hardcover advice section of the New York Times Best Seller list and stayed on the top 10 for 9 weeks. On August 3, 2010 Dungy released a new book entitled The Mentor Leader, which debuted at No. 2 and stayed on the top 10 for 5 weeks on the hardcover advice section of the New York Times Best Seller list. On January 11, 2011 Dungy and wife Lauren released a new book entitled You Can Be a Friend. Their story teaches children what it means to be a good friend. The book debuted at No. 7 and stayed on the top 10 for 1 week on the children's picture books section of the New York Times Best Seller list. Dungy was on the cover of NFL Head Coach 09 as its "cover coach". The previous head coach on the cover was Bill Cowher. Coincidentally, both coaches would retire the season after their cover issues were published. In 2007 Dungy was awarded the Amos Alonzo Stagg Coaching Award by the United States Sports Academy. Dungy, Tony; Whitaker, Nathan (2007). Quiet Strength: the Principles, Practices, & Priorities of a Winning Life. Tyndale House. ISBN 1-4143-1801-4. Dungy, Tony (2007). Quiet Strength : Men's Bible Study. Group Publishing. ISBN 0-7644-3662-7. Dungy, Tony; Bates, Amy June (2008). You Can Do It!. Little Simon Inspirations. ISBN 1-4169-5461-9. Dungy, Tony; Whitaker, Nathan (2009). Uncommon: Finding Your Path to Significance. Tyndale House. ISBN 1-4143-2681-5. Dungy, Tony; Whitaker, Nathan (2010). The Mentor Leader: Secrets to Building People & Teams That Win Consistently. Tyndale House. ISBN 1-4143-3804-X. Dungy, Tony; Dungy, Lauren; Mazellan, Ron (2011). You Can Be a Friend. Little Simon Inspirations. ISBN 1-4169-9771-7. ↑ "NFL.com Blogs " Blog Archive Dungy sets NFL record as Colts secure spot "". Blogs.nfl.com. 2008-12-19. Retrieved 2010-09-27. ↑ Aaron Kuriloff (2009-01-12). "Indianapolis Colts Coach Tony Dungy Retires From NFL". Bloomberg. ↑ "NFL Spokesmen". All Pro Dad. Retrieved 2010-09-27. 1 2 3 Chuck Finder (2006-01-13). "Colts' coach Dungy preaches what he practices". Pittsburgh Post-Gazette. ↑ Varley, Teresa. Tony Dungy credits Chuck Noll with his defensive philosophy. Steelers.com, 2001-01-31. ↑ "Dungy's time with the Colts". The Indianapolis Star. 2008-01-22. 1 2 Mark Maske (2007-02-03). "Less without Moore". The Washington Post. ↑ "Dungy leaves open possibility of retiring". Associated Press. 2006-01-17. ↑ "Belichick stands Pat: signs back long tenure". Boston Herald. 2007-07-25. ↑ Mike Chappell (2008-01-10). "How long will Tony Dungy walk the sideline?". The Indianapolis Star. ↑ "Manning's greatest drive not uphill, even though it felt that way". Associated Press. 2007-01-22. ↑ Mike Chappell (2008-01-22). "Dungy will return for 2008 season". The Indianapolis Star. 1 2 3 4 5 "Tony Dungy bio". The Indianapolis Colts. Retrieved 2007-02-05. ↑ Michael Smith (2005-12-28). "'Simple' scheme nets big gains big huge sets for the long run for trio of defenses". ESPN.com. ↑ "Vikings fire Brad Childress, name Leslie Frazier as interim coach". CNN. Associated Press. 2010-11-22. ↑ "Vikings remove interim tag from Frazier's title". CNN. Associated Press. 2011-01-03. ↑ Nicholas J. Cotsonika (2007-01-24). "Dungy tree flourishes". Detroit Free Press. ↑ Chris Harry (2007-02-02). "Dungy inspires devotion, discipline and dedication in his disciples". Orlando Sentinel. ↑ Scott Brown (2007-02-01). "Dungy proud to be legendary Steelers coach Noll's protégé". Pittsburgh Tribune-Review. ↑ Don Pierson (2007-02-02). "Dungy's legacy could be coaching tree". MSNBC.com. ↑ Karen Crouse (2007-01-23). "Bears Coach Smith reflects on his roots". The New York Times. ↑ Eddie Pells (2007-01-23). "Smith, Dungy blazing a trail". Associated Press. ↑ Hal Habib (2007-01-23). "On his terms: Colts' Dungy stays true to principles". Palm Beach Post. 1 2 Rick Gosselin (2007-08-22). "Colts' Dungy learned team aspect early". The Dallas Morning News. ↑ Judy Battista (2007-10-08). "Short-handed Colts find a way to win on their bench". The New York Times. ↑ Jim Souhan (2007-10-12). "Life is fine at the top". Minneapolis Star Tribune. 1 2 Peter King (2007-08-06). "Monday Morning QB: Factoid of the week that may interest only me I". SI.com. ↑ "Tony Dungy Record, Statistics, and Category Ranks". Pro-Football-Reference.com. 1955-10-06. Retrieved 2010-09-27. ↑ "White House Announces Rest of Faith Council, Without Tony Dungy – God & Country (usnews.com)". Politics.usnews.com. 2009-04-06. Retrieved 2010-09-27. 1 2 Mark Montieth (2007-09-06). "Dungy keeps the faith". The Indianapolis Star. ↑ CBC Sports (2006-02-17). "Dungy's son's death a suicide: medical examiner". CBC Sports. Retrieved 2009-01-29. ↑ Mishele Wright (2008-02-23). "IWU to honor Dungy for being a 'World Changer'". Marion Chronicle-Tribune. ↑ Press release (2008-02-27). "Indiana Wesleyan University honors Colts Coach Tony Dungy". Indiana Wesleyan University. ↑ Brett Wallace (2008-02-28). "IWU honors Dungy". Marion Chronicle-Tribune. ↑ Bob Kravitz (2007-07-10). "Dungy's new book transcends football". The Indianapolis Star. ↑ "Best sellers: hardcover nonfiction". The New York Times. 2007-08-05. ↑ "Best sellers: hardcover nonfiction". The New York Times. 2007-09-09. ↑ Michael Marot (2007-08-01). "Super Bowl-winning coach Dungy poised to become best-selling author". Associated Press. ↑ John DeShazier (2007-09-06). "Colts' Dungy gives nice guys good name". The New Orleans Times-Picayune. ↑ Bill Benner (2007-11-03). "Calm on display just days before the big game". Indianapolis Business Journal. ↑ Press Release (2008-01-10). "Dungy's memoir reaches 1,000,000 copies in print". Tyndale House Publishers. ↑ "Best sellers: hardcover nonfiction". The New York Times. 2008-03-02. ↑ "Another book from Dungy". The Indianapolis Star. 2008-01-30. ↑ "Newschannel 15 exclusive: Tony Dungy on his faith". WANE-TV. 2008-02-27. ↑ "Best sellers: children's books". The New York Times. 2008-07-27. ↑ "Best sellers: children's books". The New York Times. 2008-08-24. ↑ Kimberly Maul (2007-09-24). "Tony Dungy To write children's book". The Book Standard. ↑ Jeremy Herb (2008-07-11). "Dungy hopes 2nd book gives children a push". The Indianapolis Star. ↑ Jon Wiener (2008-07-11). "Dungy goes from Super Bowl Sundays to bed time stories". ABCNews.com. ↑ Press Release (2008-10-08). "Tony Dungy to write 'Legacy Book' with Tyndale". Tyndale House Publishers. ↑ Schuessler, Jennifer (2009-04-12). "Best sellers: hardcover advice". The New York Times. ↑ Schuessler, Jennifer (2010-08-22). "Best sellers: hardcover advice". The New York Times. ↑ Schuessler, Jennifer (2010-09-19). "Best sellers: hardcover advice". The New York Times. ↑ "Dungy and wife hope to coach kids to read". Pittsburgh Tribune-Review. 2011-01-17. ↑ Schuessler, Jennifer (2011-02-13). "Best sellers: children's picture books". The New York Times. ↑ John Gaudiosi (2008-03-03). "EA gives football fans dream job". WRAL.com. ↑ "Indianapolis Colts – Dungy Honored (04-15-2008)". Cache.colts.com. 2008-04-15. Retrieved 2010-09-27. ↑ Legwold, Jeff (February 6, 2016). "Brett Favre, Ken Stabler, Marvin Harrison among Hall's 2016 class". Retrieved February 6, 2015. Wikimedia Commons has media related to Tony Dungy.